THE MESSENGER: Memorable performances came from headliner Papa San and other noted names like Levy's Heritage (below). 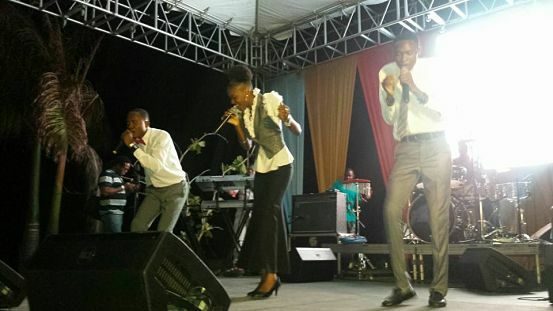 If last weekend’s inaugural staging of the Spring Praise Jamaica Music Festival taught us anything it’s that it doesn’t take a massive crowd to make a concert sizzle or even guarantee a rollicking good time, for that matter. The fair-sized audience that gathered on the top tier of the Folly Oval in Portland for Saturday’s gospel extravaganza experienced what it means to have fun in small numbers, as they shook and jived, stomped and shouted to performances by some of the hottest acts in the gospel game today. Headliner Papa San, who has virtually perfected the art of whipping a crowd into a praise riot, delivered his signature blend of kinetic energy and rapid-fire deejaying that reminded us why he’s one of the industry’s all-time greatest. Working out with his competent backing band, the icon gave compelling treatments of his classic cuts like “Jesus My Saviour”, “Step Pon the Enemy” and “Ah Yuh Alone”. A sequence of praise-and-worship anthems, given his trademark spitfire energy, brought the performance to a memorable close. Kevin Downswell also had something unforgettable in store for the Folly massive. Tunes like “When We Worship”, “He Loves Me (That’s Enough)” and “Goodbye World” made way for spirited renditions of “It’s Already Done” and “No Matter the Circumstances”. A Downswell performance would not be complete without the prayerful “Meaning of Life”, the solemn “If It’s Not You”, the catchy mid-tempo flavour of “One Day” and “Stronger,” which never fails to inspire a sing-along. The earlier hours, meanwhile, were reserved for emerging and fairly established acts. Katalys was by the far the most memorable of the lot, offering what is best described as rootsy-reggae gospel, on songs like “Open Up Your Eyes”, “Pressure” and “Let Go, Let God.” Lubert Levy and his second-generation spawn Levy’s Heritage also found favour with the crowd, in spite of their short stints. Newcomer Carey Sales (a cross between Smokie Norful and Marvin Sapp) had his shining moment, as he belted out a praise-and-worship medley that set the stage for the exuberant stylings of Sister Pat. A praise warrior with a self-assured delivery, the St. Catherine-bred singer made light work of “Victory”, “Rock of Ages” and “Roll Jordan Roll” (among others) that reassured us that the legacy of recently departed pioneers like Sister Scully is in very good hands.